In a medium microwave-safe bowl, heat the milk for 45 seconds, or to about 110 degrees. Pour into a large mixing bowl, and sprinkle the yeast over the milk. Let stand 5 minutes, or until yeast is foamy and dissolved. With a wooden spoon, stir in brown sugar, flour, butter, and salt, until just combined. Fit the mixer with a dough hook attachment, and beat on medium speed for 3-5 minutes, or until dough is soft, smooth, and elastic. It should come together in a ball, but be slightly tacky. Add more flour, one tablespoon at a time, if dough is too sticky. Place dough in a greased bowl, turning over once to grease the top. Cover and let rise in a warm place for 1 hour, or until nearly double in size. Punch down dough, then turn out onto a lightly floured surface. Cut the dough into 12 pieces - they will each be about the size of a baseball or a lemon. 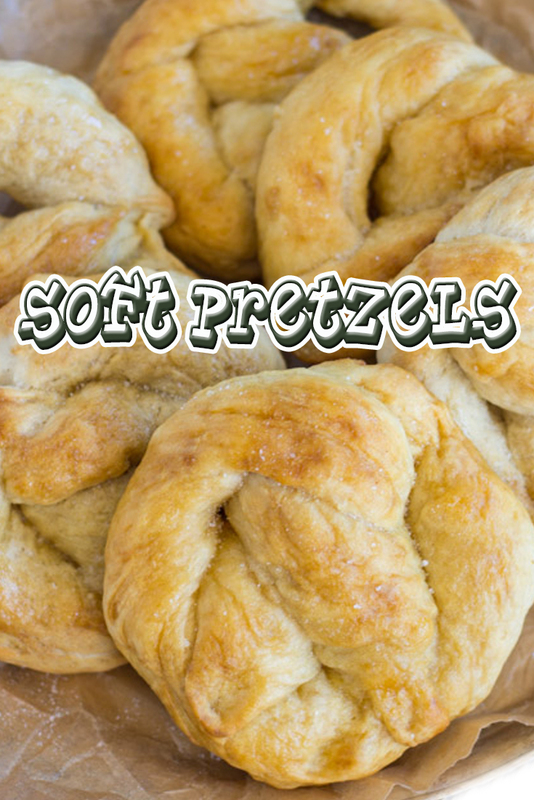 Roll and stretch each piece of dough into 24-inch long ropes, and form into pretzel shapes: twist the ends, and fold over to the round edge. Pinch at the edges to seal. Dissolve the baking soda in 3 c. hot water. One at a time, gently dunk each pretzel in the baking soda solution. Arrange pretzels onto parchment paper-lined baking sheets, about one inch apart. Bake at 450 degrees for 9-12 minutes, or until edges are golden. Remove from heat, and immediately brush with melted butter. Best served warm, but they reheat well in the toaster oven.